I received some great questions from Lynn and have imbedded my responses below. I have a few questions and was wondering the best way to go. I have the Essential anatomy course for dancers and just started to dig into it a little bit because I bought it in the summer and just had my first baby in December so its been crazy. Congratulations!!! I really want to learn more and more about anatomy and dancers. I never took anatomy at all and it has just been all my dance education along the way from anything I do know. So thank you for doing this. Its just hard because there is so so much information and I want to be able to answer a question if a kid asks me. So I do things in small stages. But was wondering I came from the erra of bouncing in stretching and then we moved in the static stretching. Now I do understand dynamic because I do warm most of my classes with a jumping and getting things moving but then we usually go into stretches and based on what you were saying I was wondering if you have something like a sample of a class run down to get the kids warmed up properly for the 20min or so and then we go into technique, center work and across floor or center combos depends on the class. Try warming them up in a cardiovascular fashion, jumping jacks, running, galloping, etc. for about 5 minutes (which you are already doing) …. no stretching…. then go into class whether that is barre or modern warmup. My daughter is 14 and very serious about her dancing. She has heel pain and has worked with a PT for the past year and rested a good part of last year. After x-rays and consulting with a few doctors her conditioned was diagnosed. As you may know, there is a small bone at the back of the heel that sticks out a bit and hyperflexion of the foot can irritate the tendons and ligaments, as I understand it, around the bone. In my daugheter’s case the small bone has not fused, but is attached. She often has pain when she points her feet. She is on pointe twice a week, but the medical people do not think the pointe work aggravates the condition. It occurs in 10-15% of dancers and soccer players. Everyone seems in agreement on the diagnosis and the surgeons want to operate to remove the small bone, but my husband and I are concerned about Grace’s age, the risk of surgery and the extent of the recovery. One surgeon quoted a journal article describing that 84% of surgery patients had positive outcomes. On the other hand, Grace often feels that she has tried everything and wants to condition resolved and to dance pain free. Do you have any suggestions or information that might help us in this situation? Dear Susan, I’m so sorry to hear about your daughter’s ankle problem. I am quite familiar with os trigonum’s as dancers are a common group that have challenges with them. There are many people, I’m sure, who have them and don’t know it because they don’t work in the extreme ranges of motion that dancers do. I would disagree with your doctors that pointe work is not influencing her ankle pain. The reason why she has pain when pointing is she’s closing the back of the ankle joint when she does that – put her on pointe with the extra weight into the joint and it often makes it worse. 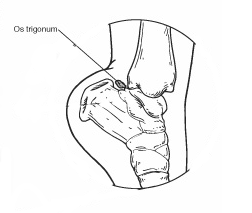 The diagram on the right shows how an os trigonum is like a nut in a nutcracker when the ankle closes. That is why they feel pain while pointing or being on pointe, and why non dancers may not have pain from this extra bone. My suggestion wuold be to take her off pointe work at this time, and increase her anti-inflammatory efforts such as placing her feet in a bucket of ice water after dancing. (I know… doesn’t sound very pleasant) The challenge with letting an os trigonum continue to irritate the tissue is the tissue in the posterior ankle area can become thickened and fibrotic – which isn’t good for anybody’s ankle. I’m assuming they tried putting her on an anti-inflammatory treatment program which probably only worked to decrease discomfort, but not alleviate it. That, along with continuing to work in non painful ways is usually the first phase of treatment. Certainly the work with a physical therapist who will make sure your daughter is working the ankle muscles correctly, to have correct alignment when pointing the foot as well as on pointe is all helpful. I applaud you for trying all things non surgical before consenting to surgery. What I can tell you is that the dancers that I know of with os trigonums and chose to have the surgery are very happy dancers. They fully returned to dancing and were so happy to pointe their feet and/or do pointe work without pain. The downtime from this surgery is much less than many other invasive surgeries. There are cases of professional ballet dancers being back to dancing within 3 months. I have known others that were even faster. I know she isn’t my daughter, (I am mom to 3) but this is one surgery where I am more confident about better chances for a positive outcome. Of course, there are risks to any surgery – but it sounds like your daughter is committed to dancing, and I do know that if it hasn’t gotten better with the more conservative measures you are taking now, that it probably won’t get better on its own. As a parent I would get her to the orthopedic surgeon that works with the athletes – and of course – has done their fair share of this specific surgery. I hope my email has helped in some small way. It is so hard to make choices like this as a parent! I’d like to request from my blog readers that if you have any experience with os trigonums please tell us about your experience by writing in the comments below. We can learn from each other! What’s up with snapping/popping hips? I had the pleasure of working with dancers from the Allegro Performing Arts Academy recently and they were the dancers shown in the picture on the post on strengthening the iliopsoas for higher extensions. This week’s post is answering a common question about snapping or popping hips. What does it mean? There are different types of popping hip but first watch the clip below to see in action the type of popping hip I’m going to talk about. The hip popping that is being shown in this clip is being caused by a tight IT Band snapping over the greater trochanter of the femur. Huh?… what muscles/where are those spots you might ask? 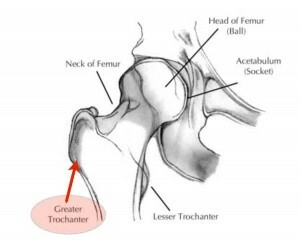 The greater trochanter is the bump that is on the outside upper part of the thigh bone right before it angles in towards the center of the hip joint. The IT Band, otherwise known as the iliotibial band, crosses over that area. The iliotibial band is the fascial band that runs down the side of your leg that the gluteus maximus and the tensor fascia lata (TFL) muscles connect into high on the leg, and the band connects then to the bones below your knee. 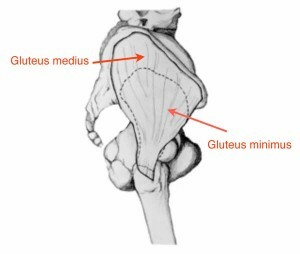 The gluteus medius and minimus don’t connect directly into the iliotibial band, but their tightness creates an imbalance around the hip that may lead to this snapping or popping hip problem. When there is excessive pull or tightness from one or more of these muscles the IT band will ‘snap’ or ‘pop’ over the greater trochanter when you lean into or stick your hip out to the side. that is what you are seeing as the clunk in the clip. It’s pretty impressive, huh? I’ve been asked by dancers if they are dislocating something because it is disconcerting to have such a significant pop, snap, clunk… however you want to describe it. The good news is…. you can work to decrease the tightness around the area and the clunking, popping, and snapping will diminish. The other benefit to addressing this? As you decrease the tightness your range of motion should improve and consequently make movements of the hip joint, like développé, battements, ronde jambe, etc. easier and more efficient. Stay tuned… next week we will look at the 3 different muscle areas and I’ll give you ways to release each area! Have a productive and joyful week! http://thebodyseries.com/wp-content/uploads/2017/02/bodyseries_logo-1.png 0 0 deborah http://thebodyseries.com/wp-content/uploads/2017/02/bodyseries_logo-1.png deborah2011-11-09 09:44:302013-10-08 13:31:26What's up with snapping/popping hips? You may have already discussed this issue in the body series but I just wondered if you had anything specific on over-weight dancers. It is so tricky discussing weight issues with students and parents that I thought if there was a general article that I could send to all students regarding the problems with joints, etc. that it would be better coming from you or another source so that they would know it is not just me having this issue. I worry so much about these girls who love to dance and want to perform full out but just don’t realize how large they are. I wish the parents could indiscretely put them on “diets” by planning meals, portions and grocery shopping lists without even mentioning the word “diet”. I would appreciate anything that would help get my point across in a good way. Weight is such a tricky topic. I’m going to start on safer ground and first talk briefly about the ramifications of extra weight on the body. The weight of our bodies is carried through the boney skeleton and of course pass through the joints. It makes sense that carrying 10 or 15 extra pounds is going to put more of a working challenge on the body, but Dr. Jonathon Cluett estimates it increases the forces by 3 on the joints. Meaning if you are 15 pounds overweight you will be putting 45 extra pounds of force through the knee joint with every step you take. If the overweight dancer has good posture and alignment they will absorb the extra force better than if they have poor alignment. What I often see in the younger dancer is weak abdominals, a anteriorly tipped pelvis giving them a slight swayback. In this scenario the knees are more vulnerable to injury and adding the extra weight increases potential for muscular strain and ligamentous injury. The self-esteem of the child who is overweight is a huge problem. They begin to define themselves as someone who is overweight and if their parents are also overweight may decide at an early age that they are doomed to always packing on extra pounds. It’s really hard to work with that situation – when the way the family eats.. and exercises… or not… can be at the foundation of our young dancer’s weight problems. So what to do? If the dancer is old enough (10 or 11) they may be able to start making their own choices about food. When the studio owner is vocal about healthy dancing practices they could choose to have a nutritionist come talk to the students all together about good eating practices. I love having outside people come in to talk to my own students because it gives me an opportunity to talk with my students at the next class about what they heard. It allows for a good group conversation or even some one on one conversations without making it seem like you are targeting them specifically. Also, the majority of parents will appreciate having a studio wanting to create healthy dancers! Even a younger child needs to decide that they want to lose weight because they believe it will give them something positive in return. So many of us who carry a few more pounds that what is ideal use food to give us something… a feeling of security, a ‘sweet’ moment, a break, a reward. I believe in stead of focusing on not eating sweets or bread or whatever might be your over-indulgence it makes much more sense to focus on what you can give yourself in other ways. For example, when I get to feeling overwhelmed I tend to overeat. When I stop to breathe or to take a short 10 minute walk around the block, or take the time to make a cup of tea… any of those activities will act to calm me down. I have a choice about what strategies I use to alter my emotional well-being (or lack of) The challenge is it takes me planning out alternate strategies before I go on automatic pilot and reach for the muffin or cookie or whatever is around to placate my overwhelm. Not always easy. The older I get and the more in control I feel about my weight the more I focus on my internal dialogue – the thoughts that I say to myself all the time. I’m going to share a quicktime clip that is part of the Inner Dance of Success Weight Loss Program. The program focuses less on specific dietary advice and instead gives lots of options and choices for different strategies for weight loss – starting with changing your thinking. This clip is on how to use affirmations (which are simply the thoughts we say to ourselves all the time) in a more positive fashion. It is a 5 minute clip and make take a minute to load. I’m always interested in your comments and your stories.. Do you have a way that you address weight challenges in your studio? If so…. please share with all of us! And remember to send me your suggestions and comments on what you think I should focus on or add onto the Body Series website and Dancing Smart Newsletter and you could win a free product! Quick reminder before answering the question that the 2011 New Year’s special will run through January 5th. Purchase Essential Anatomy: A Multimedia Course for dancers and dance teachers for $149 and get $45 off one of the best tools for dance teachers to learn important anatomical principles. Simply put TBS2011 in the coupon box when purchasing and hit apply in order to see your $45 discount.. I recently worked with (I am a Pilates and movement instructor) a dancer with a significant leg length discrepancy — her left leg is 1.8 centimeters longer than her right (femur is .6 c longer and lower leg is 1.2 c longer) . The left side of her tailbone often hurts as does her left inner thigh. She dances quite intensively and is experiencing more and more subtle aches – especially across her sacrum. Suggestions for working with her to address her leg length issue?????? Great question, Tara. When working on the reformer I would do my best to even out her leg length by having her stand or work with one of the foam nonslip cushions. Look at her standing alignment both without anything under her left leg and then with standing on a pad. Does her alignment improve? If placing a pad under her foot allows the weight to pass more evenly down the spine, through the pelvis and into the legs – that’s a good thing! It’s quite common to have the lateral curves of the spine straighten out with a pad under the foot and that’s when you know it is something that should be corrected all the time by placing a heel lift in their regular shoes as well as their soft slippers, jazz or tap shoes. There isn’t much to do with a pointe shoe – but if she corrects the inequity the majority of the time, being on pointe shouldn’t be a problem. Best of all – this dancer will intuitively know whether or not the lift makes her standing, walking and dancing feel better – and the ache across the lower back and sacral area should disappear. My name is Tina and I am a 23 year old dancer residing in New York… Anyways, I have a question my tendon in my left foot pops when I go into releve or point and flex sometimes… its not all the time but enough to be annoying… feels like the tendon is moving over the bone or something… Maybe the Post Tib tendon? Anyways, I do pronate and have orthotics but I don’t know how this happened one day I just woke up and it was popping. It doesn’t hurt but I don’t believe popping is good because it will eventually wear on the tendon… I want to dance still… I’ve been doing some peroneal strengthening exercises and checking out my alignment in releves… I just dont know what else would help… if you have anything suggestions or feedback that would be great and thanks! Tina – you are on the right track with checking your alignment and keeping yourself out of pronation. That’s great that you have orthotics for your regular shoes. You might try taping your feet for pronation while dancing to see if that decreases the popping (there just aren’t goodorthotics for dancing, unfortunately) and I would also go to a good podiatrist that will take the time to massage and manipulate your feet if some of the smaller bones you see that make up the arch of the foot. I have a dear friend who was a professional ballet dancer and went every few months to her podiatrist in Chicago to keep her feet in good shape. She was one of those loosey-goosey dancers – that I lovingly admired for her turnout and extensions – but it did mean that she had more joint laxity and was prone to ankle problems. You’re right to want to get on top of this – because it is a change from normal for you – and over time will create strain on the posterior tibialis tendon. How to keep young dancers from overturning out? I am teaching at a local ballet school. I work with the children from the ages of 3 1/2 to 10, primarily. I also conduct conditioning/pre-pointe classes for slightly older girls. I am the only teacher for the youngest dancers but do share teaching assignments with other teachers for the girls in both the Ballet 2 and the Ballet 3 classes, and the pre-pointe classes. Here is my dilemma – I would venture to state that roughly 100% of the students over the age of 8 are forcing their turnout – most with rolling in the ankles, some with exaggerated anterior pelvic tilts, most way over crossing their fifth positions. I don’t allow any of those things in my classes, and am using several of your books to educate these young dancers so they can have a successful and safe dancing experience. How do I help these students survive in other teachers’ classes? If you do post this question (and I hope you will as it is vitally important) could you please make me “Anonymous”? I don’t want to cause problems at this school as I think the students need me there. This is an excellent question and a common problem. It is challenging to fix, though, if the teachers are encouraging the students to stand overly turned out – and it is also challenging because sometimes the students are the ones that are pushing their turnout because they want to ‘look good’. I am going to focus my answer on what you can do with the students rather than trying to change the other teachers. It’s really hard to create change in another teacher’s teaching methods especially if you don’t have the support of the studio owner. You and I know that teaching ballet to young students using anatomical principles while encouraging the joy of dancing is very challenging! The one exercise to illustrate how much functional turnout a dancer is working with is the clamshell exercise. I’m going to add a variation on here for the younger dancers. Have them on the floor, lying on their side with their buttocks touching the wall and their spines lengthened along the wall and their knees bent with their feet in line with their hips. Being up against the wall will give them feedback whether they are rolling on their hip. Then have them do the clamshell exercise and keeping the feet together open and turnout the top leg. How far could they go? So many dancers are hardly getting above 45 degrees! It’s strange but true that I will find dancers who have more turnout at their hips than what they are able to functionally use in movement. So that is the first focus I would offer to your students. Develop the strength at the hip joint to accurately use their turnout. After doing the clamshell exercise, make sure to tell them to stretch the turnout muscles! Next I would encourage the students to practice barre without the barre. It is much harder to over rotate when you aren’t gripping the barre. Have them do that barre in stocking feet rather than soft slippers. They may be able to feel the weight on their feet more easily and hopefully self-correct to bring the weight evenly on the pads of the big toe, little toe and heel. Last suggestion I would have is to impress upon them to focus on their movement, rather than their positions. This is a hard concept to get across because so many budding ballerinas are looking at pictures of a gorgeous dancer in a magnificent poses. To help them focus on their movement I would have them begin to play with qualities. Ask them to exaggerate what moving with tension and using all of their muscles feels like. (this is commonly what they are doing☺ ) Then ask them to move gently, slowly, without any sharpness to their movement. Try giving them different imagery to help. A rubber band when stretched slowly won’t snap – but if it is stretched too quickly it may break or snap back. Explore how a feather floating on the wind moves… and bring that into their demi plies or tendues. Experiment with many images, including contrasting ones as well. The goal is to have them thinking and feeling in new ways about their dancing, which in turn will give them better feedback encouraging them to more easily create changes in their patterns. Perhaps a back door approach – but you never know what is going to create an aha moment. I’d like to open up this conversation to other teachers…. What do you do to help young dancers use their turnout effectively and efficiently, and most importantly – safely? Post your comments in the boxes below! http://thebodyseries.com/wp-content/uploads/2017/02/bodyseries_logo-1.png 0 0 deborah http://thebodyseries.com/wp-content/uploads/2017/02/bodyseries_logo-1.png deborah2010-10-23 06:56:132010-10-23 06:56:13How to keep young dancers from overturning out? I am a ballet teacher and I have a student that is 15 and just found out she has scoliosis. She has been dancing all her life and is a good dancer. When I found out that she has scoliosis it put some things into perspective about her body and how she uses it. She has always had very tight hips and has an arch in her lower back. I was getting ready to give her the exercises from the Analyzing Turnout DVD but I wanted to ask you if there is anything that I shouldn’t have her do or better yet anything different that she can do to work around the scoliosis? Her limitations in this area make so much more sense to me know that I know what she is dealing with. She is affected in the thorax region and I would like to help her any way I can. She has aspirations of having a career in dance so any guidance you could give me would be greatly appreciated. On another note, you are amazing! I have LOVED everything you have done and use it on a daily basis while teaching. When I was growing up and being taught ballet no one cared about how your body was built and how that played into learning how to use it. I think I am finally getting through to my students that it is okay if you don’t have perfect turnout and if you work correctly you can increase your turnout and still be able to move around when you are older. Thanks so much for all you have done and are continuing to do for the dance community! I have had several other teachers sign up to get your newsletter and they all have enjoyed it as well! Great question! Let’s talk about scoliosis. There are 2 primary categories of scoliosis, the type that is idiopathic and comes on during the early adolescent growth, and a type I’ll call functional scoliosis, which is when the spine responds to a leg length different or other structural/muscular asymmetry. Sometimes there is a combination of both. I had a wonderful dancer/client I’ll call Sunshine (not her real name – but she had such a positive attitude:) who had her scoliosis picked up around the normal time of 12 -13 years of age. She went to a doctor who specialized in scoliosis who said she needed to have surgery because the curve was greater than 40 degrees. The mom was not about to say yes to surgery before they tried everything else first because she accurately understood that scoliosis surgery is one of the most difficult surgeries for children. That is when they came to me. I looked at Sunshine’s standing alignment and saw that she had leg length discrepancy and when I put something under the heel of her shorter leg, it improved (decreased) the spinal curves. That was encouraging. It meant that there was an aspect of her scoliosis that was functional. One of her major curves in the thoracic area had a major rotary component to it. It is what people see when a student with scoliosis rounds over…. The ribs rounding back on one side. We started working on increasing her ability to rotate more evenly through all the areas of the spine. You see every time the spine has lateral flexion (or side bends) it will always rotate. It does this to take the stress off that area of the spine. Try this. Sidebend your head so your right ear goes towards your right shoulder. Leave it side bent to the right (which is right lateral flexion of the neck) and now turn your chin first to the right, down towards your shoulder, and then rotate it to the left, up towards the ceiling. It felt freer when you rotated right – yes? This is an example of how the spine wants to rotate to take the strain away from the side bending. I had her do twisted push-ups against the wall – doing more on the side with less flexibility. She imagined a huge X going from the shoulders to the opposite hips – and instead of slumping into her normal standing alignment, which was sinking into one hip, she constantly corrected herself to imagine the 2 lines of her imaginary X were the same length. She had exercises (primarily rotation) received massage and craniosacral work to support the new muscle patterning, put a heel lift under the short leg – which she wore everywhere including her soft slipper – just not in modern class. The lion’s share of the rehab I will give credit solely to her commitment to making postural changes. This is not easy as an adolescent! Sunshine went back to the doctor 3 months later, then 6 months later – and since she was showing improvement in her x-rays he allowed her to continue whatever she was doing☺! She never did have surgery and continued to dance, graduating with a dance degree from college and is now dancing professionally with a company based in France! The point of this longish story is not to say that surgery is NEVER needed – rather it is to encourage any parent who has a child recently diagnosed with scoliosis to make sure there are no functional aspects to the scoliosis that could be addressed. As far as your question about giving her the exercises from the Turnout DVD – yes, you can give her any of them. I would especially encourage you to see if her iliopsoas and hip flexors are tight – and then to have her focus on stretching them. Check or have someone check to see if there is a structural leg length difference that might be exacerbating the curve – and focus on giving her many images for long spine and one that easily rotates! First of all I would like to thank you for the great website and your great blog! I am a 19-year-old ballerina and have been doing ballet recreationally since I was 5. A couple of years ago I decided to take it more seriously and to train more hours. I have three questions and I would really appreciate it if you had the time to answer them. The first one is a rather short one: How can I prevent Achilles tendonitis, especially as I have noticed that I pop my ankle more often, which I didn’t use to do as much before (it doesn’t hurt). The two remaining questions have to do with each other: As I have been training more now, I have been working on my développé, they aren’t that bad, but not really outstanding: I can do about 100 degrees but I really wish to get it higher. However it seems that it is not only the muscles that are making it harder to improve, but also a popping in the front of the hip when LOWERING my leg after a développé and sometimes when raising the leg, too. As I noticed that, I kept stretching the iliopsoas muscle before développés and battements, it got better but it still pops and keeps me from doing my best (although it doesn’t hurt, my leg feels like “not free”!). Could it be another muscle that needs to be strengthened and stretched? How can I get rid of that popping and improve my développés at the same time? Thanks a lot for taking the time to read my letter! Great questions, Liz! Let’s start with the easier one first. If your ankle is popping more, that doesn’t necessarily mean that you are on your way to developing Achilles tendonitis – but it does make me wonder what’s happening in your standing alignment. Evaluate honestly if the weight is staying balanced between the front and back of the foot – are you over turning out at the feet in first position – and can you do a demi plié and keep the anterior tibialis tendon (the one at the front of the ankle) during the descent of the plié. Check those 3 areas and correct them as they may be creating some muscle imbalance. Stretching is key for the Achilles tendon – and while most do the traditional lunge calf stretch, I prefer putting my foot over a thick book, and then stepping forward with the other leg to do a modified lunge. You don’t have to step very far forward to get a super stretch of the calf muscles. Also do this also with the back knee just barely bending to place the stretch down towards the tendon. Both variations are important. Many dancers aren’t aware of the importance of a strong iliopsoas to their extensions and développés. When you are lifting the leg to the front there is a point above 90 degrees where the quads are less effective and the iliopsoas becomes more important for a gorgeous high extension. 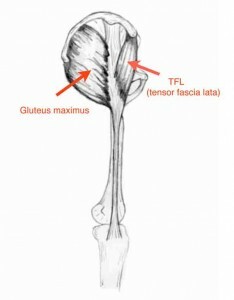 I’m posting a quicktime movie of an iliopsoas strengthening exercise. You will place a theraband around the thighs and then bring the knee towards the chest.. You can also do straight leg legs or développés. The more upright you are by moving from your elbows to your hands, the harder. Do these exercises with the leg slightly turned out leg. It is a challenging exercise but you will be quite happy with the results, I promise! Then stretch the iliopsoas afterwards. I’ll be curious if your ‘popping’ will get better after balancing out the strength to flexibility of the all important iliopsoas muscle. I’m putting it all together as we speak – and they will be ready to order (along with some very special bonuses) next week – for sure! I have put together over 3 hours of quicktime movie clips (along with an outline and study guide) that bring anatomy to life – talking and illustrating important muscles, concepts and what to do… in order to dance smart and teach smart. After clicking the link the movie will open up and take just a moment to load. I am a 15 year old ballet student who hopes to pursue a career in dance. Right now I have an achilles tendon injury that requires passive healing, a lot of physical therapy and may take many months to heal. I have been off of dance for about 2 months now, and I’m having a very hard time coping with this rest period. Going from 15 hours of ballet a week to none has put me in a kind of “dance withdrawal.”. I am trying to keep in shape, but there is really no physical activity that compares to ballet for me, and I have a hard time finding the motivation to go to the gym. Do you have any reconmendations for keeping in physical shape (flexibility, strength, balance, core work, etc.) and also in a good mental state during periods of injury rehabilitation? Thank you so much, your blog is a wonderful resource. I’m so sorry to hear about your Achilles tendon injury. It is especially rough for someone like you who is used to being so active. I know your ankle is being taken care of with going to physical therapy, so we’ll focus on the right of your body ‘s well being. I’d like you to first focus on the perspective that this is a good cross training opportunity for you. How is your cardiovascular strength? What about your upper body? That is an area that many women could improve – especially in these days of extreme athleticism and using your arms for support in contemporary choreography. Those 2 areas along with core work with theraband or foam roller could easily be focused on during your rehab – even without going to the gym☺ (I don’t like the gym atmosphere and also prefer working out at home) I like using the kettle bell for my cardio. It’s amazing how much you work within just a minute. It’s a weight that has a handle on top and you swing it for between a minute and 2 minutes (I started at 30 secs) and then rest, walking around for a few minutes in between. You are doing interval training with this. Cardiovascular health is about the ability of your body to recover from stress. I found a kettle bell demo on youtube that is better than most – although I will say that I do not ‘snap’ my knees or suggest that my dancers do as she is showing on this video. Bring them to straight, using the gluts and engaging the abdominals as you straighten your legs – but do it without snapping. Here’s the youtube link so you know what I’m talking about. This time off from dance is a great time to be focusing on virtual rehearsals – using visualization to set new pathways from the brain to the muscles. I’d like to tell you a fascinating story about Marilyn King, who was a two-time Olympic athlete and later a coach at the University of California. Her story beautifully demonstrates the power of mental rehearsing. She made the 1972 pentathlon team and placed 13th in the 1976 Olympics. She was determined to do even better at the 1980 Olympics and gave herself all of 1979 to train for the trials that would happen in the spring of 1980. In November 1979, she was in a head-on car accident and suffered a severe back injury. Her friends and physicians felt her chances for competing in the Olympics had come to an end. She spent four months in bed, a daunting setback for anyone training for a physical competition. During those long months, Marilyn was determined to continue training and working in the only way she could, which was in her head. She went through every event in her minds eye and watched endless hours of the world’s best pentathlon athletes competing. Sometimes she watched them frame-by-frame. When she was able to walk again, she went to the track and continued to train by envisioning herself going through each event successfully. When it came time for the trials, she was better enough to compete and put herself through five grueling events—without having months of physical preparation, as the rest of the athletes had. She described moving almost as if in a dream, as she had rehearsed it so many times in her head during the past months. She placed second in the trials and went to the Olympics that summer. Inspiring story, yes? She had a strong desire, focused only on what she wanted – cultivated by an emotional attitude that supported success—and took the actions she knew would optimize her performance, physically training when she was able and mentally training when she was not. Elite athletes have long known about the power of mental rehearsing. Musicians and dancers are beginning to be more aware of the body/brain connection to their performance. Watch the videos of your favorite dancers, put music on and go through barre, or other warm-ups… in your mind’s eye – not in real time. Imagine how good you are going to feel when you are back in class – and feel that way now! What I know about healing is those who are able to maintain a positive attitude, imagining the best coming out of the situation, rather than the worst, are often the ones who heal the quickest as well. Hope that helps – and best wishes for a speedy recovery! Last week during an over enthusiastic assemblé I managed to slip, flip into the air, and fall on my back. My doctor said I bruised a bone; my sacroiliac joint. It has been nearly 2 weeks, and I have been resting it. However, it still hurts to développé do the left side, left passe, and land on the left side (it’s my left sacroiliac joint). I am supposed to start intense ballet classes next week. What should I do? Will dancing with the bone bruise make it worse, even though nothing is touching it? Is it ok to dance through this pain? Is the pain that I experience during passe due to damaged ligaments or something? I am really nervous about this. Ouch! Bone bruises can take a long time to heal. You were right to make sure there was no fracture in the area – and then I’m imagining the doctor told you to ice the area to help decrease inflammation. With bone bruises you won’t see a lot of visible swelling, but rest assured, it’s there – so icing can help. My concern is that you fell on the sacroiliac area so you may have created a small torque at that joint which isn’t helping your rehabilitation. Remember there is a small amount of movement that is possible at the sacroiliac joint, and it’s possible that landing so heavily on one side could have created a small shift. Gentle stretching is the key. Try sitting on a chair and cross your left ankle over your right thigh. Lace your hands underneath your left knee and gently press your left knee into your hands. This turns on the deep gluteal muscles. Now keep a gentle pressure down into your hands as you slightly tilt forward with a straight back. Think of the sits bones reaching back into space. You’ll feel a stretch somewhere in the left buttock area. If it is too strong – don’t tilt forward so much. You are in control of how much effort and how much pull – and it should be comfortable, not painful. After doing this 1 – 3 times on each side – stand back up and try first position passé. Is there a difference? Any easier? After a fall like you took you need to be aware and watchful for muscular imbalances and possible strains as after all – it wasn’t just the pelvis that took the hit. You have lots of muscles in that area that also were impacted and that is where I would have you focus your attention. The hip flexors might also be involved, and doing extra stretches may be useful. As always…. listening to your body’s messages is key. If doing a specific movement increases your discomfort pull back. Think about what is different about that movement from movements that don’t hurt. Then you can begin to investigate more specifically what muscle area you need to attend to. It is often hard to figure out what is muscle and what might be ligament in an area such as the sacroiliac joint, but with gentle exploration you can begin to tease out more specifics as to what makes it worse and what makes it better. If you don’t feel that you are making a fast enough recovery I would encourage you to see a good physical therapist to check out the range of motion of both hips and the muscular balance around the pelvis. Sending you positive intentions for a speedy recovery!